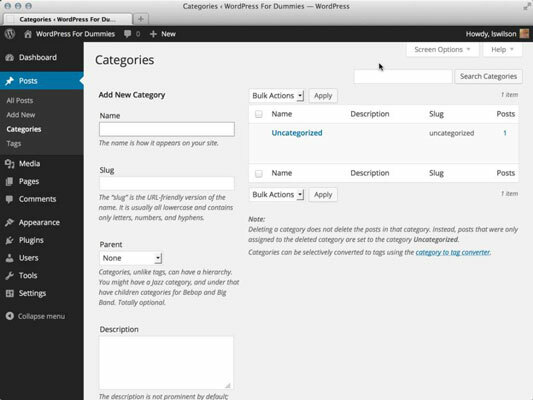 Upon installation, WordPress gives you one default category to get you started called Uncategorized. That category name is pretty generic, so you’ll definitely want to change it to one that’s more specific to you. The default category also serves as a kind of fail-safe. If you publish a post to your blog and don’t assign that post to a category, the post is automatically assigned to the default category, no matter what you name the category. 1Click the Categories link on the Posts Dashboard menu. The Categories page opens, containing all the tools you need to set up and edit category titles for your blog. 2Click the title of the category you would like to edit. To change the Uncategorized category, click the word Uncategorized, and you go to the Edit Category page. 3Type the new name for the category in the Name text box. Type the new slug in the Slug text box, as well. 4Choose a parent category from the Parent drop-down menu. If you want this category to be a main category, not a subcategory, choose None. You can type a description of the category in the Description text box if you choose to remind yourself what your category is about. Some WordPress themes display the category description right on your site, too, which can be helpful for your visitors. 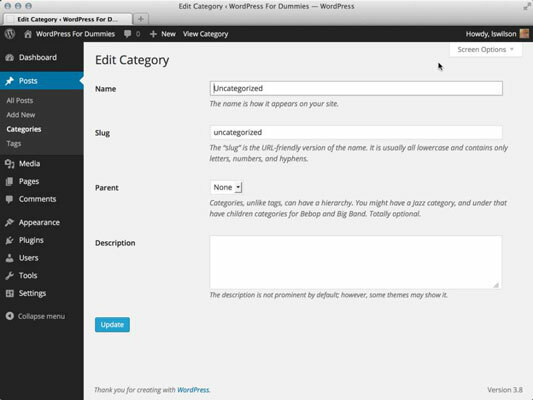 You’ll know if your theme is coded in this way if your site displays the category description on the category page(s). The information you just edited is saved, and the Categories page reloads, showing your new category name. If you want to edit a category’s name only, you can click the Quick Edit link underneath the name on the Category page, which you see when you hover your mouse over the Category name. Then you can do a quick name edit without having to load the Edit Category page.